I was looking at what was trending on Twitter tonight, and I saw the hashtag #MakeASongAboutSomeoneElse. So, if you were wondering - that is where I got the idea for the above infographic. 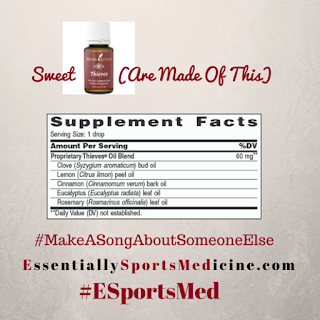 Thank you The Eurythmics for writing Sweet Dreams (Are Made Of This)! With naturally derived ingredients, Thieves® Dish Soap is our plant-based formula that effectively cleans your dishes without chemicals, dyes, or synthetics. Young Living pure essential oils—Thieves®, Jade Lemon™, and Bergamot—work with natural enzymes and other botanicals to leave your dishes sparkling clean. Enjoy eating your fruits and vegetables as nature intended with Young Living’s Fruit & Veggie Combo Pack. Bundled together, Young Living's Fruit & Veggie Spray and Fruit & Veggie Soak utilize naturally derived ingredients and the cleansing power of Thieves® essential oil blend to effectively wash produce at home or when on the go. 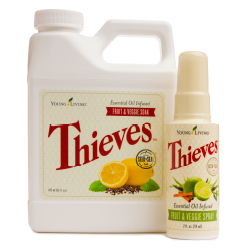 Thieves Fruit & Veggie Spray is great for single-use servings or when you are away from home. The convenient 2-oz. spray bottle fits in a purse, backpack, or carry-on, making it easily accessible. With just a few spritzes, you can quickly and efficiently clean fruits and vegetables no matter where you are. Thieves Fruit & Veggie Soak is a perfect choice when cleaning larger amounts of produce. With the help of DiGize™, Purification®, and Thieves essential oil blends, you can prepare produce for a wonderful meal or a healthy snack. 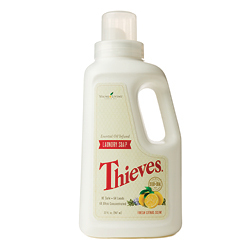 With a plant-based formula, Thieves Laundry Soap gently and naturally washes your clothes, leaving them truly clean without any chemical or synthetic residue. Natural enzymes and powerful essential oils add to the formula’s strength to leave your clothes fresh and clean with a light citrus scent. Thieves® Waterless Hand Purifier utilizes powerful essential oils to clean and purify hands. Moisturizing emollients, Aloe Vera and vegetable glycerin, enrich our formula and add their hydrating benefits. The larger 7.6 oz. bottle is ideal for every room in your house. Making a family-sized bottle readily available could increase your family’s use and motivate children to be proactive in keeping their hands clean. Use Thieves Waterless Hand Purifier as an optimal tool when trying to increase your family’s overall hygiene. The improved Thieves® Household Cleaner has increased cleansing power and an even safer, more sustainable formulation. The new formula contains ingredients from renewable plant and mineral sources, vegetable-based surfactants, and even more Thieves and lemon essential oils for extra cleaning power. Bottle is 100% recyclable. Thieves® Spray is ideal for use on door handles, toilet seats, and any surface that needs cleansing to protect from dust, mold, and undesirable microorganisms. This small bottle is perfect for traveling or keeping in your purse, backpack, or medical kit. 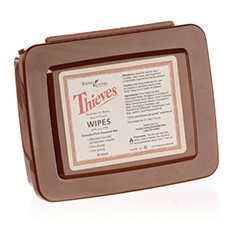 Thieves® Wipes are ideal for use on door handles, toilet seats, and any surface that needs cleaning to protect from dust, mold, and undesirable microorganisms. Keep a pack handy in your bathroom, kitchen, car, office, or anywhere else you want to keep your environment clean. 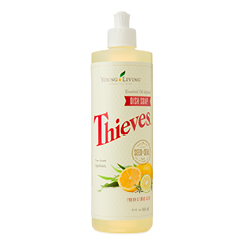 Thieves® Foaming Hand Soap will cleanse, defend, and condition the skin with the therapeutic-grade essential oil blend Thieves, pure lemon and orange essential oils, aloe, Ginkgo biloba, and vitamin E. Dispensed as a rich foam, Thieves Foaming Hand Soap contains gentle ingredients so it can be used often without drying or stripping the skin. This 4 oz. premium, all-natural toothpaste is made with pure, therapeutic-grade essential oils, including the cleansing and protective benefits of Thieves essential oil blend. Its safe and effective formula provides a fortress of support for healthy gums, strong teeth, and a confident smile. It is the optimal choice for health-minded consumers. 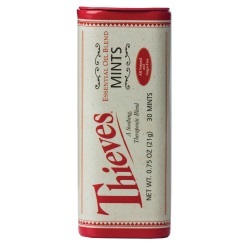 Enjoy the cool, invigorating taste of Thieves® Mints. 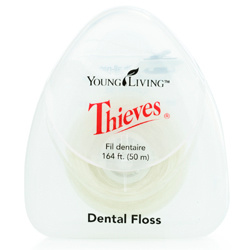 The sugar-free ingredients include the power of Thieves® and peppermint essential oils, providing a healthy alternative to freshen your breath. 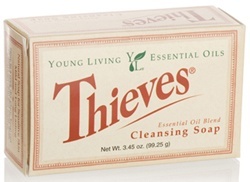 With all of these products in the Thieves line, you can see how awesome Young Living's Thieves essential oil blend is! 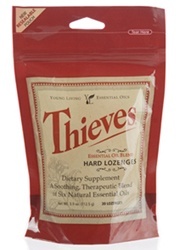 Click on any of the above links to order Thieves essential oil products. If you are interested in becoming a wholesale member, and earn 24% off the retail price, order a Premium Starter Kit with Thieves. If you have any questions, feel free to contact me through the contact form on the right side of this page. I would love to help you!